Administrators at times would like to alert there users of a new account or having to setup the modusCloud password by sending a welcome email. This will allow the user to confirm his identity and specify a password login for his\her account. 1- Select Users & Group. 2- Check the checkbox beside the user(s) you wish to send the Welcome email to. 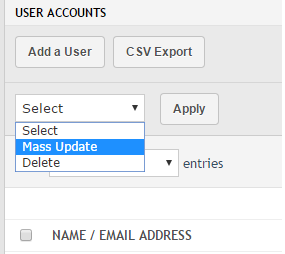 3- Select Mass Update from the drop down list. 4- Check the Send Welcome Email checkbox. All your checked end users will receive a welcome email.